In classical art, the horse was one of the favorite animals of most sculptors. "Guide for you" tells about the famous equestrian monuments of Klodt, Montferrand and other domestic masters in St. Petersburg. The very first monument to Peter I (today it is called Connetable) was commissioned to create Carlo Bartolomeo Rastrelli during the life of the Emperor. Peter personally ordered a monument to commemorate the victory over the Swedes in the Northern war. Rastrelli was inspired by the triumphal statues of Roman emperors, so the sculpture itself is so similar to the equestrian statue of Marcus Aurelius in Rome. In 1725, Peter I died, and the monument was never completed — work on it lasted until the end of the 1750s. It was led by the son of Rastrelli-Francesco Bartolomeo. He offered to install the monument on the square in front of the Zimny Palace, but was refused. In 1799, by decree of Pavel I, the monument was installed on the square in front of the Mikhailovsky castle. Especially for the monument, Fyodor Volkov created a granite pedestal decorated with sculptural bas-reliefs with images of" Poltava battle "and" Battle of Gangut", made under the direction of Mikhail Kozlovsky. On the monument left the inscription " great-Great-grandson." 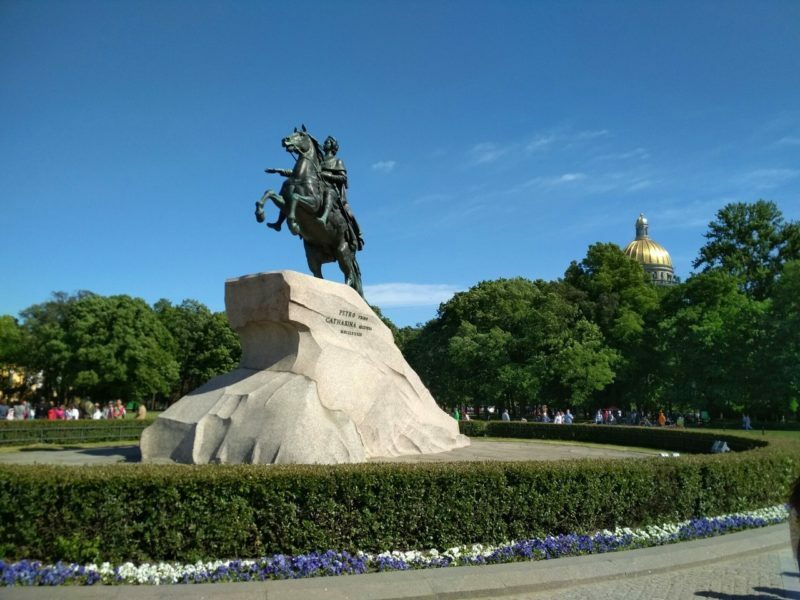 The monument to Peter the Great, who became known as The Medny horseman from the light hand of Alexander Pushkin, was created by order of Catherine II by the French sculptor Etienne-Maurice Falcone. Originally Catherine saw the monument as a statue of Peter in the guise of the Roman Emperor with a rod or scepter in his hand. State dignitaries also offered options: Jacob shtelin advised to portray Peter surrounded by allegories of Prudence, Diligence, Justice and Victory; Ivan Betskoy — to make a figure of the whole height with a rod in his hands. However, Falcone showed perseverance, and as a result, the Medny horseman turned out to be the way we know him today: "I will limit myself only to the statue of this hero, which I do not treat either as a great commander or as a winner, although he, of course, was both. The personality of the Creator, the legislator, the benefactor of the country is much higher, and it is necessary to show it to people. My king does not hold any rod, he stretches his beneficent hand over the country he is traveling around. He climbs to the top of the rock, which serves as a pedestal, is the emblem of the difficulties he defeated." Work on the monument was long and painstaking. It took three years to create a model rider: at the request of the sculptor guard officer daily for many hours put on the rear of the Imperial horse, and Falcone sketched his figure from nature. The head of the Emperor molded the pupil of Falconet, Marie-Anne Collot, and snake — Fyodor Gordeyev. The casting of the statue with the gun, a master Yemelyan Hilulim been Falcone. Finally, in 1782 on a monolithic rock, known as "Thunder-stone", set the figure of the rider. On the pedestal was inscribed "Peter the Great Catherine the Second summer 1782". The monument made a strong impression on his contemporaries, Prince Trubetskoy wrote: "the Monument to Peter the great made a great decoration of the city, and this is the third time I've toured it and I can not yet be satisfied. Purposely went to Vasilievsky island, to watch and there is absolutely fine." Narvskiye gates were built in 1814 in honor of the return of Russian troops From a foreign campaign, where they defeated Napoleon. Since the gates were built in a hurry-they had to play the role of the triumphal arch, through which the victorious warriors would enter the city-they were originally built of wood. The author of the gate was Giacomo Quarenghi, who came up with the project of a single-span arch with a chariot of glory drawn by six horses. The sculptural decoration was executed by Ivan Terebenev. But ten years later, the wooden gates were dilapidated and fell into disrepair — then it was decided to build a new arch of brick, lined with copper sheets. The design of the gate was entrusted to Vasily Stasov, and the sculptural works were performed by Peter Klodt, Stepan Pimenov and Vasily Demut-Malinovsky. They created A victory statue with a palm branch and a Laurel wreath in their hands, on a chariot drawn by six horses. In the niches of the gate placed the figures of ancient soldiers. Supervised the construction personally Nikolas I-he claimed all the sculptural models. During the war, the gates were badly damaged, but it did not prevent them in 1945 to become a triumphal arch again: through them were the victorious soldiers of the great Patriotic war. Initially, the arch Of the General staff was to be decorated with two female figures holding the Russian coat of arms — such a project was approved by Alexander I however, Nikolay I, who replaced him on the throne, decided to make the arch a symbol of the glory of the Russian army — then it was decided to crown it with a horse The sculpture was to be made by Alexander triskorni, but in the end it was entrusted to the domestic masters Stepan Pimenov (he performed nick and the right warrior) and Vasily Demut-Malinovsky (he created horses, chariots and the left warrior). The location of such a massive sculpture on the top of the arch caused a lot of questions: if all the figures were metal, the monument would weigh unaffordable 80 tons. Then decided to make cast iron only frames of figures, and on top of them to impose copper sheets — it reduced the weight five times. Modern Anichkov bridge appeared only in the middle of the XIX century, although the crossing on this site existed from the beginning of the XVIII century. When the bridge was officially opened in 1841, the newspaper " Severnaya Pchela "wrote:" the New Anichkov bridge is admired by all residents of St. Petersburg. The crowds are going to admire the amazing proportion of all parts of the bridge and horses — boldly say, the only ones in the world." The famous figures of horses decorating the bridge on the sides were executed by the sculptor Peter Klodt. In 1841, painted plaster statues were installed on the bridge, and bronze statues were ready a year later. However, then Nicholas I decided to give them to the Prussian king Friedrich Wilhelm IV, and leave the plaster on Anichkov bridge. Only two years after the opening of the bridge, new bronze horses appeared on it. However, this epic with the statues is not over — two years later Nikolay II gave them to the king of Sicily Ferdinand II, and their place again took alabaster copies. Clodt decided to take advantage of this and created a bridge for new sculptures — "the Conquest of horse by man." Son of Klodt Michael recalled: "in Pavlovsk, his father got a horse Serko. Serko, an old veteran of the court stables, was a completely white one, and served as a model for his father when he sculpted Anichkov horses. <...> Another horse — Amalathas's also a model for aniskovich horses, was a white Arab, docile and lovely, immaculately folded. Her father trained her: she, on his orders, stood on his hind legs and took all sorts of poses . The new statues were ready in 1850-four different sculptural groups showing the process of taming the horses." Six-meter horse statue of Nikolay I was installed on St. Isaac's square four years after the death of the Emperor — in 1859. The author of the project was Auguste Montferrand, and the sculpture was performed by Peter Klodt, who was able to create the world's first equestrian statue standing on two points of support. It was done due to the metal rods inserted in the horse's legs are not poured in the horse's rump fractions, as did his contemporaries. The Emperor is depicted in the form of the life guards of the Cavalry regiment, the chief of which he was. For a horse to Klodt posed stallion of Nikolay I, Amulates. The pedestal of the monument is made of marble and granite — it is decorated with allegorical figures of Power, Wisdom, Justice and Faith. For them, the sculptor Robert Zaleman posed for the Emperor's daughter Maria, Alexandra and Olga. On the pedestal are four bas-reliefs that reflect the key events of the reign of Nikolay I: the uprising of the Decembrists, the suppression of Cholera rebellion, the publication of the" Code of laws of the Russian Empire " and the opening of the Nicholas railway. The" comod " of the monument (granite pedestal) was executed by Fyodor Shekhtel. On the pedestal there was an inscription: "to Emperor Alexander III, the founder of the great Siberian way". "Bonehead" Alexander III the townspeople called because the Emperor was not depicted in dress uniform, as was the custom, and in baggy clothes and not the most graceful pose. As Schechtel himself said about his work, " a portrait should not be a copy. In clay or on a cloth I transfer idea of this person, the General, characteristic that I see in him". The Bolsheviks came to power after a while removed the monument from the square. For a long time he was in the vaults of the Russian Museum. Today it stands in front of the Mramorny Palace (a branch of the Russian Museum).